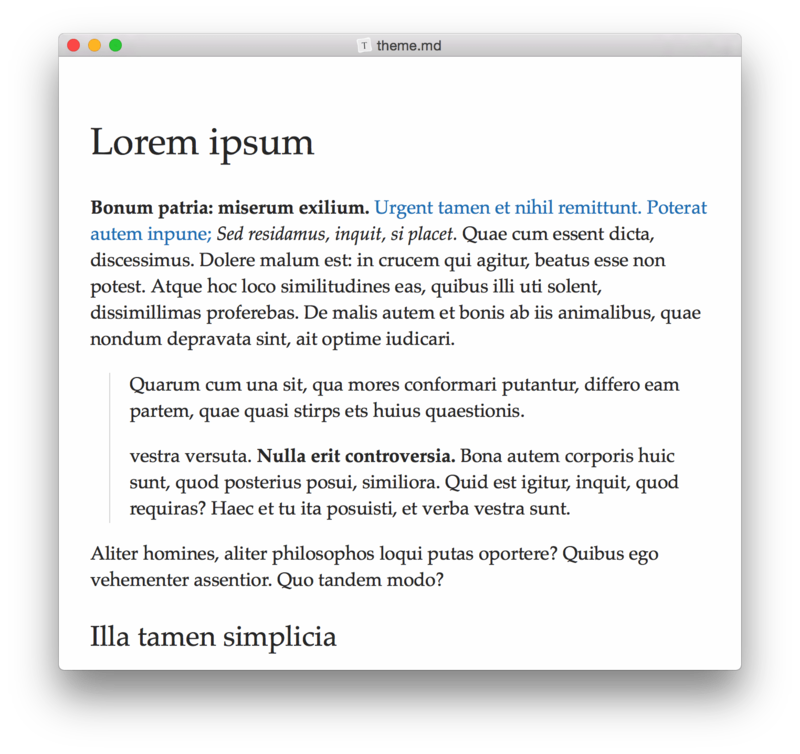 Typora — a markdown editor, markdown reader. 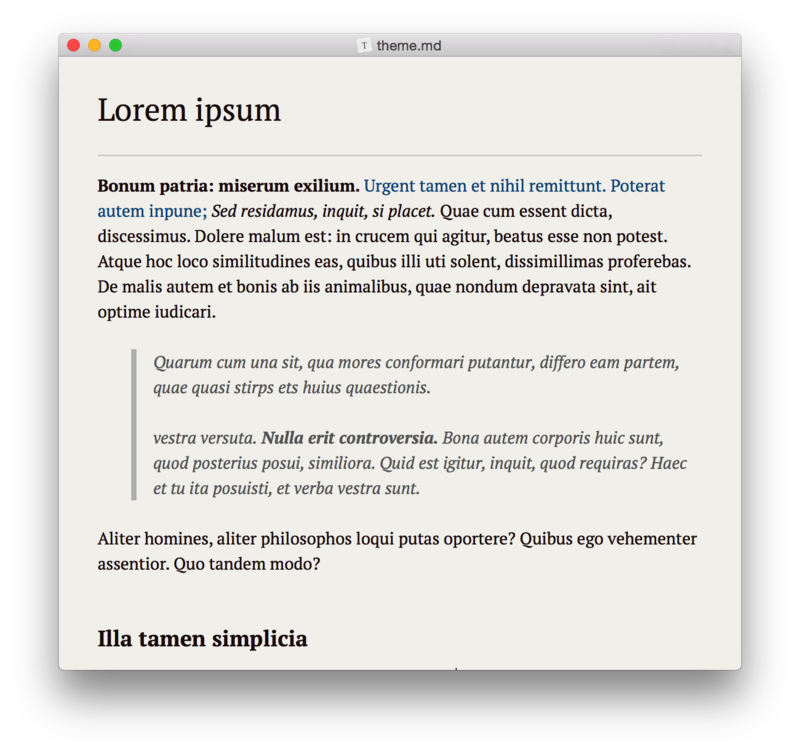 Typora will give you a seamless experience as both a reader and a writer. 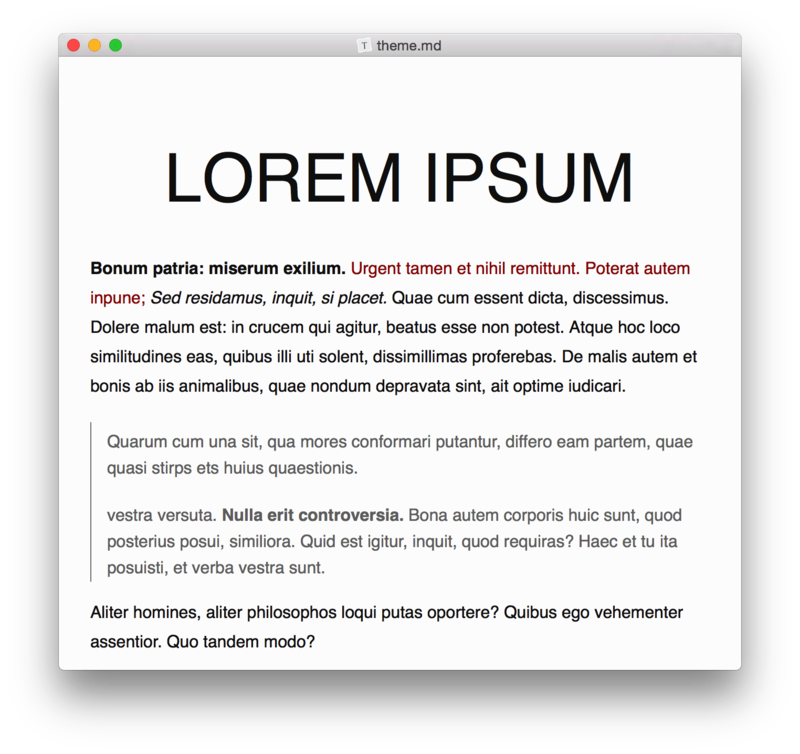 It removes the preview window, mode switcher, syntax symbols of markdown source code, and all other unnecessary distractions. Replace them with a real live preview feature to help you concentrate on the content itself. 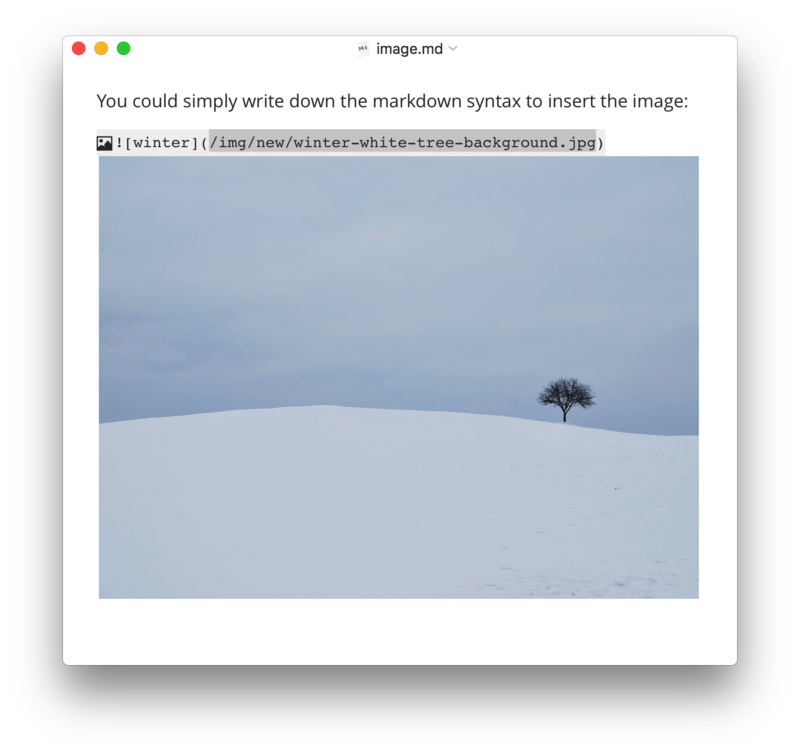 Sharing markdown file with images shouldn't be painful. Images can be uploaded to cloud server on macOS with integration of iPic Service. Hard to display retina image with correct size? Typora support <img> tag with customized size or zoom factor. When handling relative path of a local image file, you could set its base path towards the root folder of your static blog. Insert images will be quite easy via drag & drop. 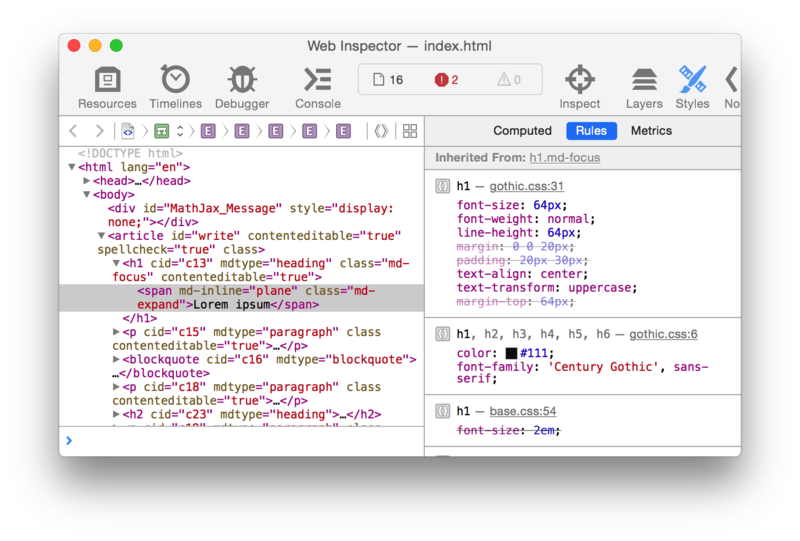 Use your own css code to change font size, alignement, or even make some magics possible, such as Auto Numbering Headers. Type `[TOC]` to insert table of contents, all headings will be listed here. 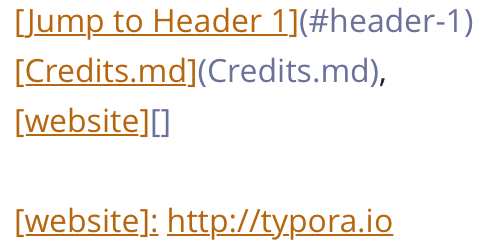 Set the href to headers, which will create a bookmark that allow you to jump to that section after clicking. 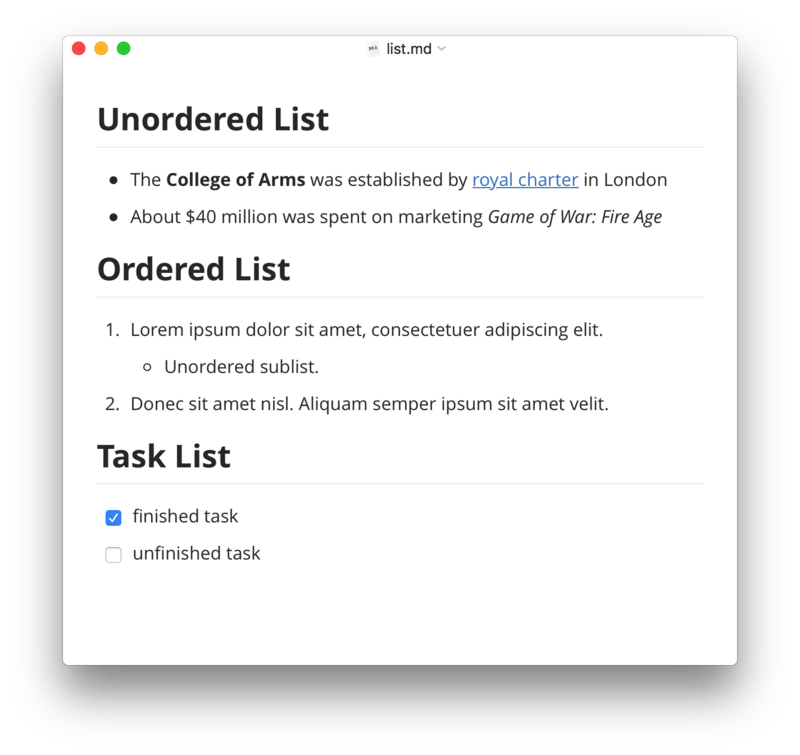 Arrange nested lists like a rich editor, by tab and shift+tab key. GFM task list supported. Able to manage simple todos in a markdown file. Use shortcut keys, context menu or touch bar to change list type from one to another. 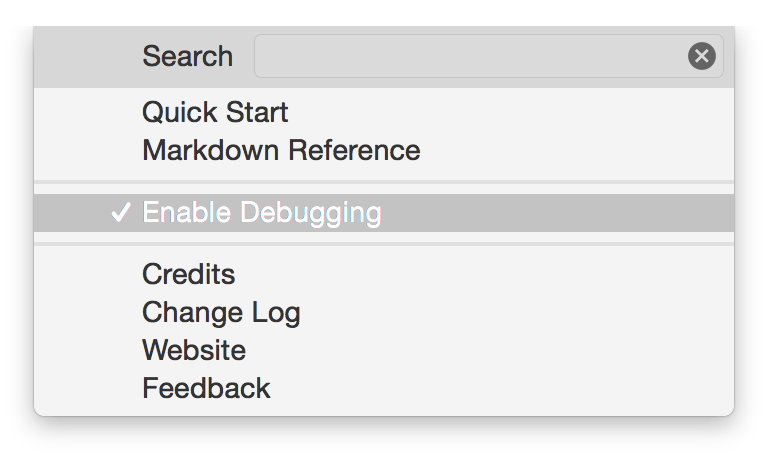 Quickest steps to resize tables in Markdown file: just mouse dragging. 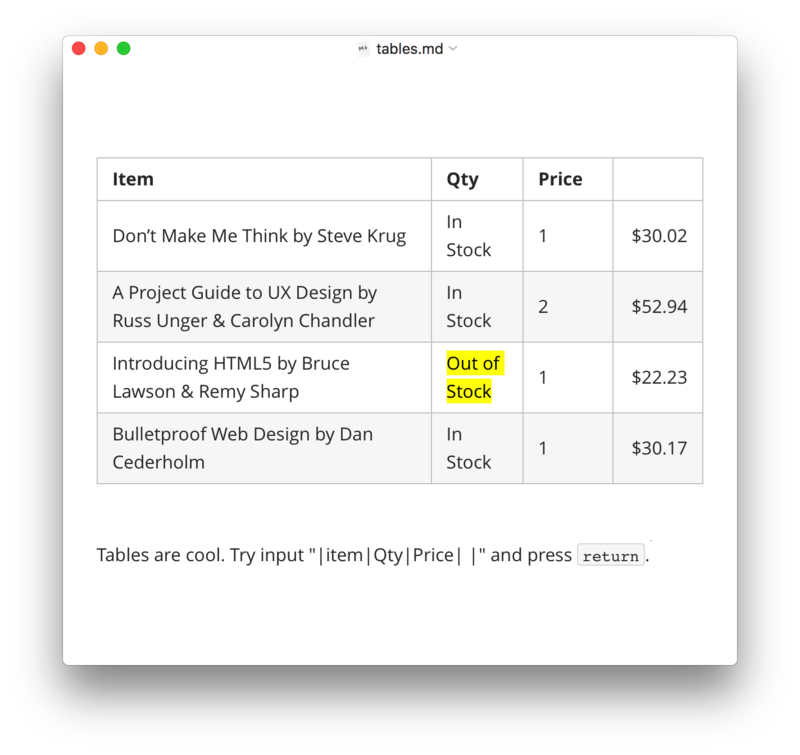 Use shortcut keys to generate tables with given layouts. 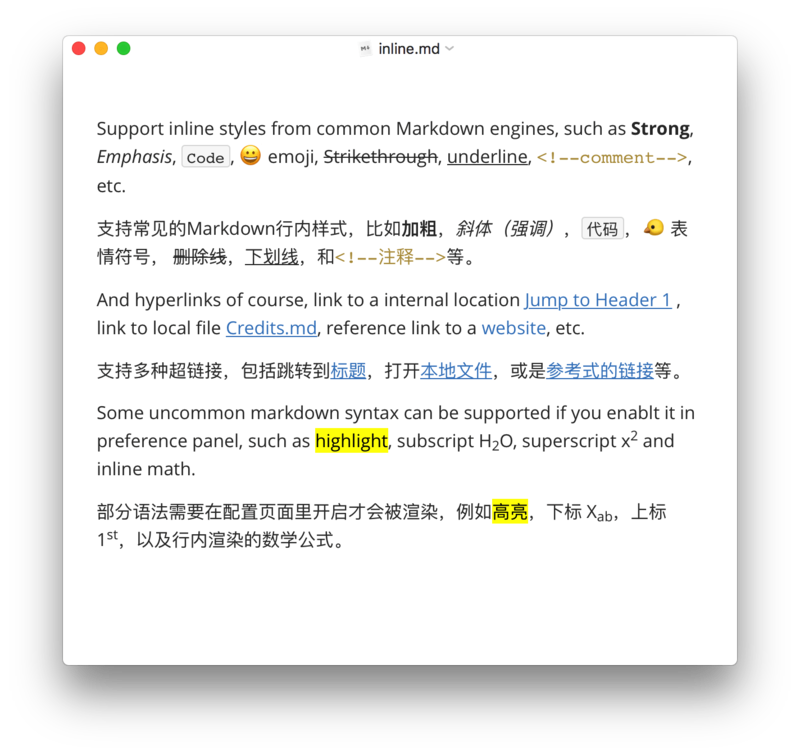 Type markdown directly is also supported. Display line numbers can be turned on in preferences panel. 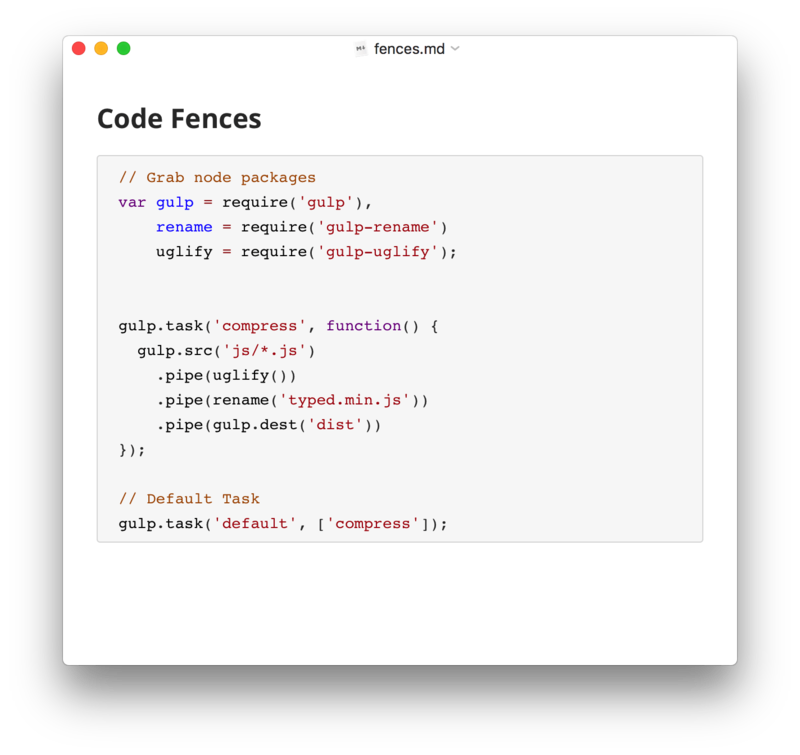 Typora supports around 100 languages for syntax highlighting, covers all common programming languages. Preview while you are typing. 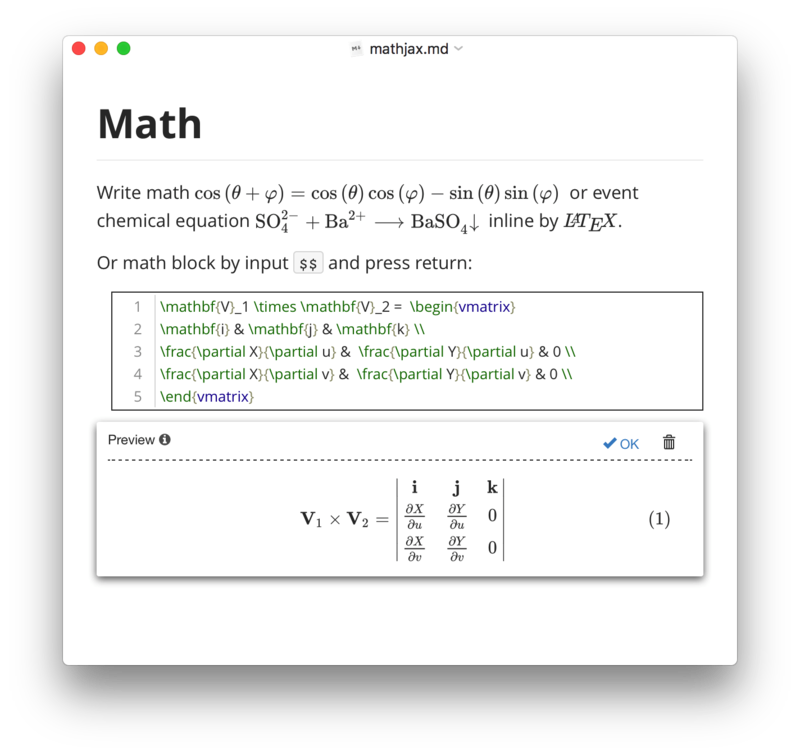 Most MathJax extensions built-in, including mhchem, AMSmath, BBox, etc. Auto numbering math equations (enable in preference panel). Draws simple SVG flow chart diagrams powered by flowchart.js. Show Error hint on live. 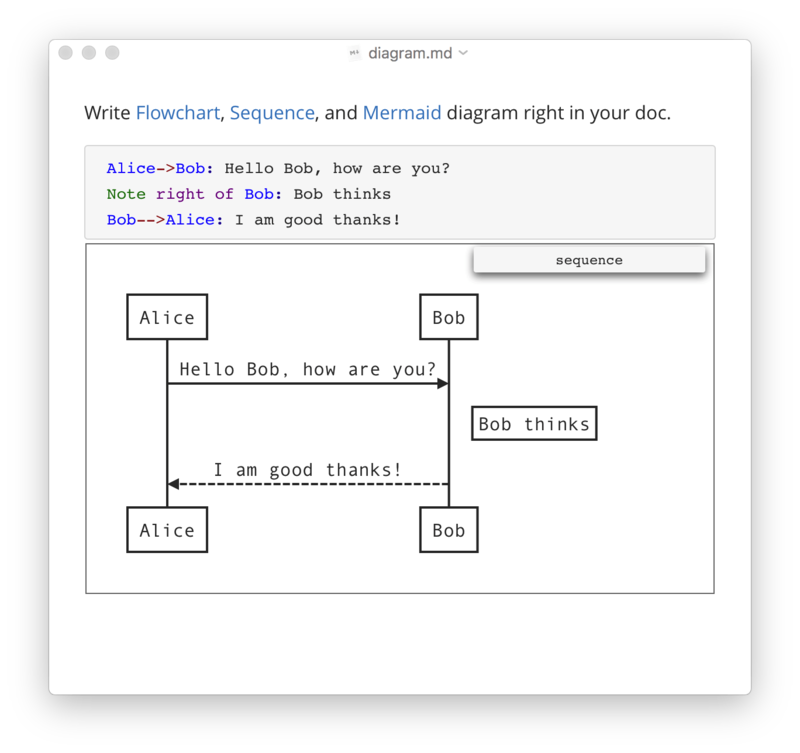 Generation of flowchart, sequence, gantt and more by mermaid engine. Draws simple SVG sequence diagrams. Input the emoji you want via auto-complete. 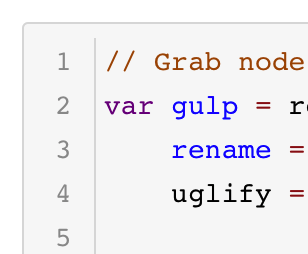 Set your the link targets towards a header, a markdown file, or an URL. Use shortcut keys one familar with. All styles incldue Strong and emphasis can be correctly rendered in CJK charsets. Uses email-style > characters for blockquoting. Horizontal lines styled by CSS. 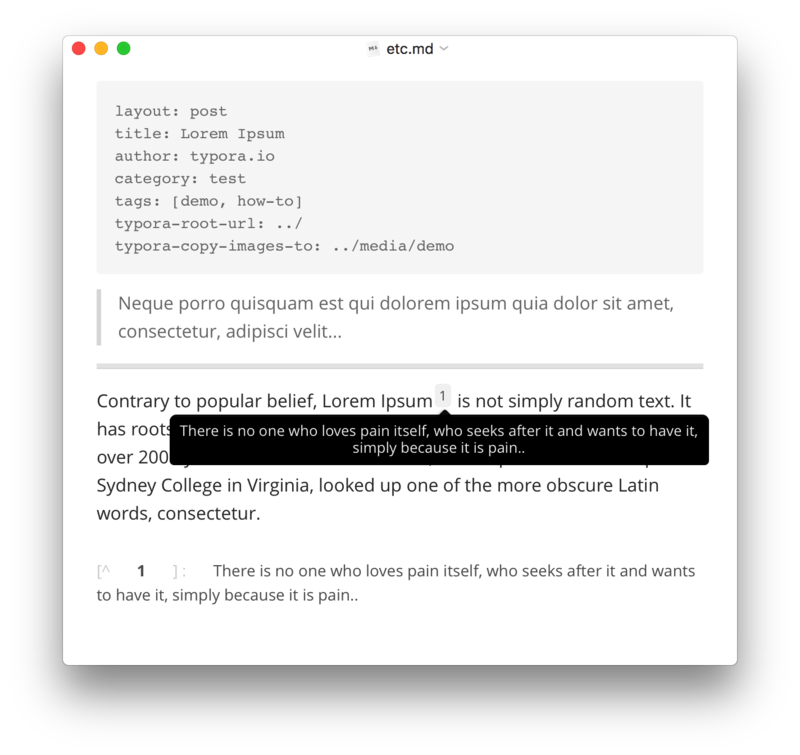 Display footnotes you write on hover. Typora provides both file tree panel and articles (file list) panel, allows you to manage your files easily. Files are organized on folders which allows you to sync your documents using your own cloud service, like Dropbox, all up to you. Outline structure of your documents will be extracted in outline panel, which allows you to quickly go through the document and jump to any section with one click. 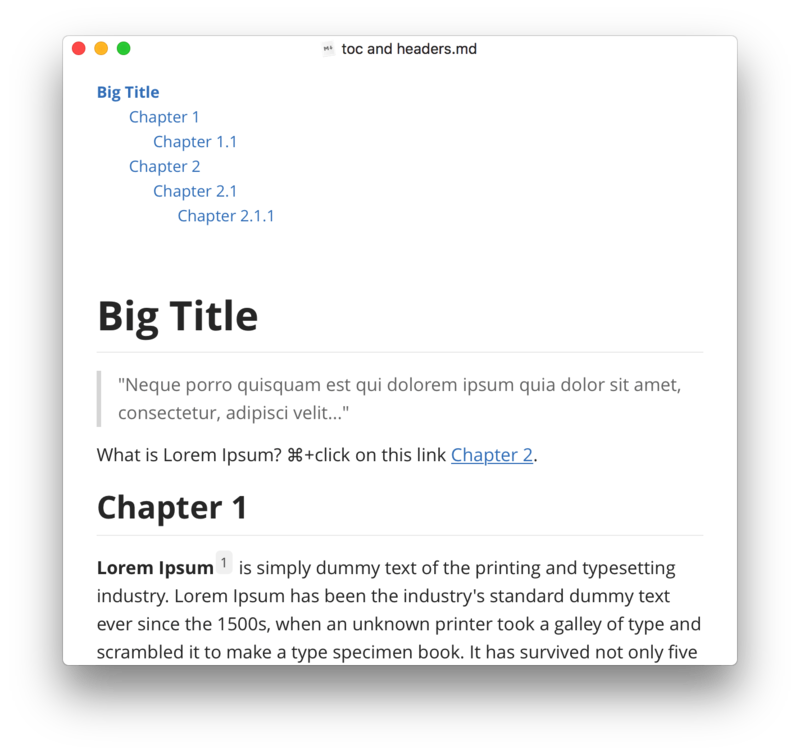 PDF with bookmarks can be generated by typora. With integration of Pandoc, more formats, including docx, OpenOffice, LaTeX, MediaWiki, Epub, ect, can be exported or imported. See how large your document is in unit of words, characters, lines, or reading minutes. Focus mode help you to focus only on current line, by blurring the others. Typewriter mode will always ensure current active line is in the middle of the window. Auto complete pair of brackets and quotes like a code editor. Also, a option is provided to auto pair markdown symbols, like * or _. 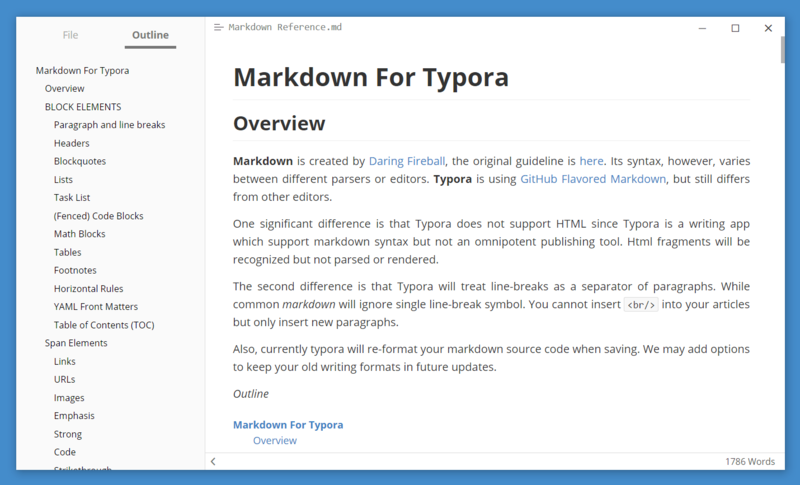 There is just something so natural about writing #markdown with @Typora. 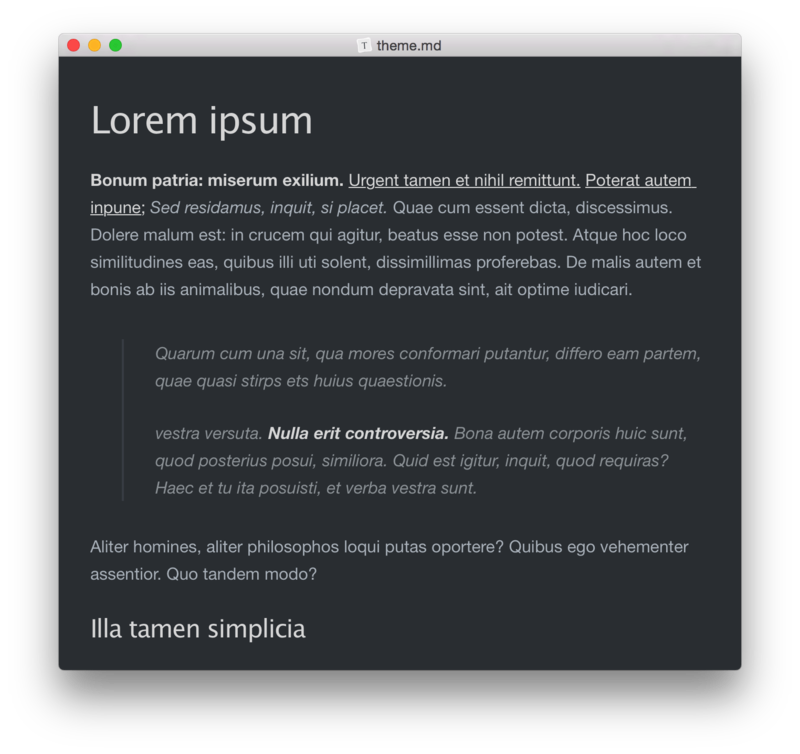 This is one of the nicest Markdown editors I've ever tried. Here is more words from our users.